There are few affordable standalone systems that allow you to transmit video over the air, and back in 2016, I had the chance to check out V-Bridge Muses-β MPEG-2/-4 encoder and DTV modular taking HDMI or composite video input. It was easy to use and worked fine, but it would still cost close to $600, and might have been a little smaller. 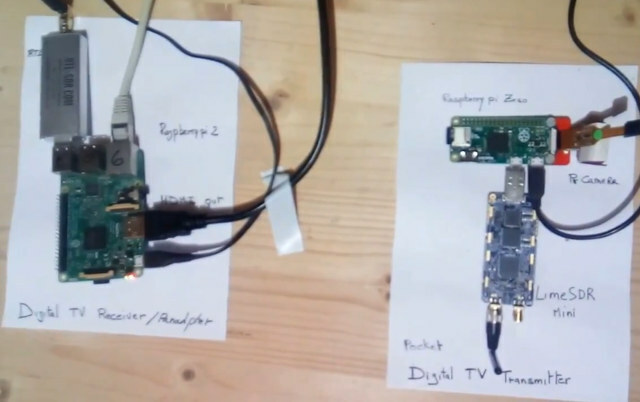 Evariste Okcestbon has now created its own digital TV transmitter prototype, combining LimeSDR Mini USB SDR board with Raspberry Pi Zero board, and instead of supporting external input from HDMI or AV ports, he used an official Pi camera for video, and was able to transmit the video over a 1.2 GHz connection to a Raspberry Pi 2 with an RTL-SDR dongle, with the Pi 2 board also taking care of displaying the video signal. The Raspberry Pi 2 is also running KisSpectrum spectrum analyzer software in parallel at step 2. All code is open source, and you’ll find packages and tools mentioned above in Github. The video below demonstrates the setup in action and explains how it works. LimeSDR mini sells for about $140 on Crowdsupply, so you’d just need to add the Pi Zero and Pi camera, with a total hardware cost of less than $200. The prototype is also quite a compact solution, but still messy with the cables, so we’ll have to see if Limemicro Systems or a third party ends up creating a “DTV Transmitter pHAT” for an even more compact and neater solution. As a side note unrelated to the project above, Lime Micro has just introduced a LimeSDR Mini Grove Starter Kit for Raspberry Pi in collaboration with Seeed Studio that is now listed on Crowdsupply for $249.